If you’re under the impression that in order to attain a gleaming, streak-free shine on your glass surfaces ammonia has to be involved, you’re in for a real treat. There’s a green, clean alternative. Method's plant-based powergreen™ technology eliminates dirt, dust and pesky handprints—with no streaks or chemical stink. Powergreen™ technology is cutting-edge green chemistry that harnesses the strength of naturally derived, non-toxic ingredients to deliver a mighty cleaning punch. in method's glass cleaner, a corn-based solvent eliminates dirt, dust and pesky handprints, so ammonia is but a distant memory. Waterfall Fragrance: Since it’s not practical to call it quits on reality and retreat to Windermere Island, consider this your temporary solution. Your 15-second escape. Your oasis in a desert of routine. surrender to the scent of cool, cascading water lily + sandalwood. Ingredients: water (aqua), ethanol, decyl glucoside, sodium carbonate, potassium citrate, fragrance (parfum), polymeric colorants. With a good cloth this works well. I use it on windows, mirrors, shower doors and stainless steel appliances. I love that itâ€™s eco friendly and not tested on animals. I love the smell, it does leave streaks sometimes, nothing insane. You have to really look at it to see them. I do find if you put just a little bit more time into really buffing the mirrors you don't see any streaks. Smells amazing too! This is amazing for glass. Leaves absolutely no streaks! This product is fantastic! Great fresh smell and my mirrors have never looked so clean. No streaks. I love every Method product. This one cleans beautifully and doesn't leave streaks. Method is the absolute best that I've tried . I use all their products for cleaning and my home sparkles ! I especially love that I never have to worry about using these products around my pets or if they get on my skin...they're great! Shiny and clean windows, no streaks. Better than windex, especially the scent. Works great! Will be buying more very soon! This was my first time buing this cleaner and I was happy because it's a very good product!!!! I love it. It's so easy to use and the final result is great! This was my first time buying the glass cleaner from method... I use a lot of their other products and love them. I was happy this one didn't disappoint! Streak free and works just as well as Windex but smells so much better. Nice scent but not overpowering. Nice scent and streak free. It was my first time buying a method product and it's definitely worth the money. 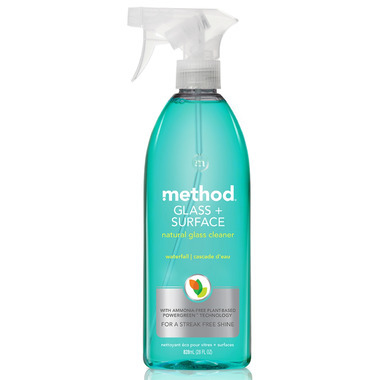 I love Method products in general because they're vegan friendly and don't test on animals, but also mainstream enough that they're easy to find everywhere and also work great. I had the grapefruit all-purpose cleaner already and decided to get this one (which also works as an all-purpose) because I keep one in the washroom and one in the kitchen. I'm very happy with them! The smells are also really nice, but don't have a strong lingering effect. I love this product. Waterfall is my favourite scent of Methods. This cleaner is great for mirrors and windows. Cleans all surfaces leaving no streaks. Great scent. Amazing product. Doesn't leave streaks and has a subtle fresh scent. I use it in the kitchen and bathroom. Great glass cleaner. I use many Method products. Wish more came without fragrance. So glad to find this product! Smells great, cleans my glass & windows ever so quickly, no streaking! I now order ahead, so I don't run out! This is a great cleaner to have on all the other surfaces in your home. It smells wonderful and really works. If you have grandchildren or children, you will want to keep a bottle handy for those fingerprints that crop up. Love the scent of this and it does a good job. Better than the regular brand X and not toxic , great scent as well . Fantastic product , no longer use the ammonia based cleaners , this does a better job , I M O and not toxic , win win . I love the method Glass & Surface cleaner! I see that it cleans well, no streaks or anything left behind, just the shine. It leave everything clean. The scent is light and fresh and I know it's not toxic! This is the best glass and surface cleaner. The scent is amazing. Glass surfaces are left sparkling clean. This is the best cleaner for my caesarstone countertops! We only use natural cleaning products in our house and this is the best! Love that it is natural. Does a great job on multiple surfaces and I love the fresh scent. Will definitely order it again. Works great on glass shower doors and mirrors in the bathroom, nice scent. Will buy again. Find it cleans the glass shower doors better than the shower cleaner (which is way too over powering and didn't do that great a job). Great glass cleaner. Smells good, but I accidentally ordered this thinking it was the mint glass cleaner. I will buy mint next time. Cleans really well leaving no residue or streaks. No ammonia smell! The scent is very clean and refreshing.